Current rating is the most important criterion in the selection of electrical connectors. It is stated in amps per circuit and is a measure of the amount of current that can be passed through a mated terminal, which will give no more than an 85°F (30°C) temperature rise over ambient 72°F (22°C). This current level is then derated or adjusted for the number of circuits in a given housing due to the heat (temperature rise) of the adjacent terminals. For example, a typical wire connector can carry up to 12 amps/circuit on a 2- or 3-circuit housing, but only 7.5 amps/circuit on a 12- or 15-circuit housing. Note that the current rating for a particular circuit size assumes all circuits of the housing are carrying the rated maximum current. The current rating also assumes that the maximum wire gauge for that connector family is used. For example, if a standard connector family has a maximum current rating of 12 amps/circuit, the use of 14 AWG wire is assumed. If a smaller wire is used, the maximum current carrying capacity should be derated by 1.0 to 1.5 amps/circuit for each AWG gauge range less than the maximum. Electrical connector size is becoming more important in the wire connector selection process with the trend of downsizing equipment. Circuit density is a relative measure of the number of circuits an electrical connector can accommodate per square inch. It is relative in that using this measure, one can objectively determine the space requirements or size of one connector family versus another. Delphi HES (Harsh Environment Series) connectors offer high current capability and high circuit density with small housings available in 47-circuits. Engagement force refers to the effort required (stated in pounds/circuit) to connect, mate, or engage the two populated electrical connector halves. If the application required a 10-circuit housing, the total engagement force for the wire connector would be equal to the total number of circuits (10) times the engagement force per circuit. The engagement force is of major concern in two primary situations. The first is with high circuit count electrical connectors (typically greater than 9 circuits), while the second is in applications where the wire connectors will be mated to a printed circuit (PC) board via a header. In the high circuit count application, total engagement forces for some connector families can be as high as 50 lbs., a force which may be considered excessive for some assembly operators or in applications where the electrical connectors are difficult to reach. In the second case, when mating to a header or to a connector mounted on a PC board, high mating forces may damage the board. In both cases, a "low force" terminal within the chosen connector family or an electrical connector family with a lower engagement force/circuit should be used. Wire size is an important criterion when choosing the right electrical connectors, especially in applications where the current rating required is near the maximum for the chosen connector family, or where mechanical strength in the wire is required. In both cases, a heavier wire gauge should be chosen. Most electrical connectors will accommodate automotive wire gauges of 16 to 22 AWG. Note that the Metri-Pack 480 electrical connector line can accommodate up to a 10 gauge wire. 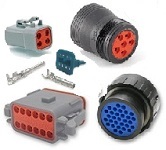 Most applications are within the 250V rating to the standard wire connectors, although some connector families, such as the Molex MX150L connectors offer a 600V rating. The voltage ratings are RMS values and, therefore apply to both AC and DC voltages. Generally, the higher voltage ratings are obtained by fully enclosing both the male and female terminals individually in the housing. Shrouded housings or fully isolated contacts also offer protection to the metal terminals during assembly and handling of the wire connector. Assure that the electrical connector system has been tested to a consistent specification with respect to other connector systems. Most connectors meet the requirements of UL and CSA agencies. IP ratings and salt spray tests are indicators of the connector's resistance to moisture and contaminants. Either positive or passive appropriate for a given application can best be determined by the degree of stress to which the mated electrical connectors will be subjected. A wire connector system having a positive lock requires the operator to deactivate a locking device before the connector halves can be separated, whereas a passive locking system will allow the connector halves to disengage by simply pulling the two halves apart with a moderate force. In high-vibration applications or where the wire or cable is subjected to axial loads, by design or by accident, positive locking electrical connectors should be specified. Strain reliefs or backshells for electrical connectors can be a major criteria in the extra degree of safety that a non-conductive strain relief housing provides. Should a terminal or wire become dislodged from its seated position in the wire connector housing due to being mechanically over-stressed, the strain relief can prevent the "live" wire from contacting other components or "neutral" conductive members. The one-piece strain relief shown in figure 1 features an integrally molded tie strap to firmly grip the wires. This design does not require any additional assembly hardware and it will work with either half of the wire connector, thus minimizing inventory requirements. It also has a removable strap holding the top cover to the base, again reducing the number of pieces to order, track and inventory. Materials and platings are typically one of the last major decisions to be made. Most electrical connectors are made from a nylon plastic. This nylon can have flammability ratings of typically UL94V-2 of 94V-0. The higher 94V-0 rating indicates that the nylon will extinguish itself (in case of fire) more rapidly than the 94V-2 nylon. A 94V-0 rating does not infer a higher operating temperature rating, but rather a higher resistance to flame continuance. For most applications, the 94V-2 material is adequate. The standard terminal plating options available for most electrical connectors are tin, tin/lead and overall or select gold. Tin or tin/lead platings are appropriate for most applications whre per circuit currents are above 0.5A. Gold plating terminals, like the terminals offered in the Deutsch DTP compatible Amphenol ATP Connector line, should generally be specified in signal or low current harsh environment applications. Terminal base materials are either brass or phosphor bronze. Brass is the standard material and affords an excellent combination of strength and current-carrying capabilities. Phosphor bronze is recommended where a thinner base material is used to obtain a lower engagement force, high engagement/disengagement cycles (>100 cycles) are likely, or where prolonged exposure to high ambient temperature (>29°F/85°C) are likely. The price of electrical connectors should be calculated on a basis of total applied cost, i.e., the cost of the housing (both plug and receptacle) , the cost of the terminals, plus the cost of the labor to attach the wire to the terminal and to insert the terminal into the housing. Most connector companies offer a full range of application tooling equipment from crimp tools to removal tools for low volume production and repair to semi-automatic bench presses that are capable of terminating as many as 3,000 terminals/hour (operator dependent). So which criterion is the most important? After current rating, your specific application will dictate whether connector size, engagement force, wire size, configuration and circuit size, operating voltage, agency approvals or price is the criterion which defines the right power connector for your application.